Much has been made recently of Barcelona’s desire to play on wet pitches with very short grass to aid their short, quick passing game. Tonight, they faced an opponent who has a very soft pitch with long grass. As a result, short quick passing becomes more difficult to achieve and players lose their footing when they try to turn quickly. The pitch at Estadi Ciutat de Valencia has been like this all season, so it was hardly a surprise for Guardiola yet they failed to react to this until the second half, still determined to play intricate short, sharp passes on a poor quality surface. More opponents will leave their pitches dry and with longer grass against Barcelona. A quicker, more direct approach is needed in such circumstances. Barcelona need to learn to adapt more to these challenges. Following on from the point above, in addition to the pitch being poor, Levante were always going to defend deep and in numbers. They only average 40% possession per game. They are a deep lying, counter attacking side with Kone leading the line. Combined with the pitch, why did Guardiola not start with Cuenca to pull Levante wide? With Sanchez and Pedro both coming infield, Levante could outnumber Barcelona due to sheer weight of numbers. Similar to the game vs Milan, Cuenca has an impact simply based on his starting position alone. He pulls defenders out very wide and creates space. He helped create the equaliser and then won the penalty which Messi converted. Cuenca is becoming an increasingly useful player for Barcelona. There is arguably nobody else in the Barcelona squad who offers the same qualities as he does in an attacking sense e.g. the width and the ability to take an opponent on the outside. He is a traditional chalk on the boots winger. If the entire Barcelona squad was fully fit and Guardiola had to chose his strongest starting eleven, who would he chose as his central defensive partnership? Surely Mascherano would be a starter? He makes more tackles and interceptions per game than anyone else in the Barcelona squad. He is second only to Xavi in the number of successful long passes per game. He can be an attacking asset as well as a defensive asset. Crucially, he has eliminated his previous habit of picking up yellow cards all of the time. He has 9 yellows from 46 appearences this season. Tonight, Mascherano beat Kone to a ball through the Barcelona defence when they trailed 1-0. He won the tackle cleanly and knocked the ball back to Valdes. He then collected the ball from Valdes, moved upfield and released Cuenca which led to the equalising goal. From initially being used in defence as a stop gap measure, he has made the position his own. And so the wait continues for Atletico Madrid. It is now 23 games since they last beat Real Madrid in a league or cup game. The year was 1999, Spain still had peseta’s and Jimmy Floyd Hasselbaink scored the winning goal. What’s stranger still is that Atleti were relegated that season too. Atleti came into the match on the back of a disappointing 2-0 away defeat at Levante. Three changes were made to the team with Falcao, Perea and Tiago being recalled as replacements for Salvio, Suarez and Miranda. The inclusion of Perea was clearly due to his pace, Simeone obviously aware of the Madrid counter attack. Atleti varied from a 4-4-2 when defending with Arda wide left to a 4-3-3 when attacking. Arda pushing forward and Adrian moving to the right. Mourinho made four changes to the Madrid line up following their 0-0 draw at home to Valencia. Ramos, Kaka, Di Mario and Coentrao all came into the starting line up at the expense of Albiol, Ozil, Higuain and Marcelo. The changes for Madrid indicated that Mourinho expected a tougher game than normal. A front four of Ronaldo, Ozil, Benzema and Higuain would have been too open and attacking away from home against a better quality opponent. Di Maria was recalled for his first start after injury. The workrate of Di Maria on the right and his ability to tuck into form a midfield trio with Alonso and Khedira when Madrid are under pressure is highly rated by Mourinho. 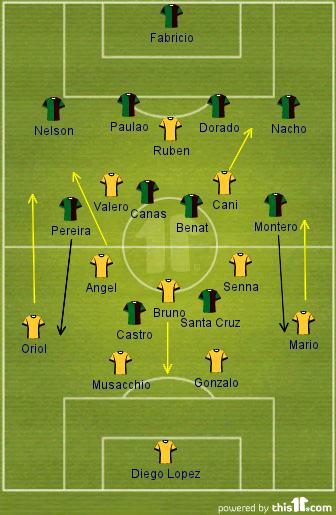 In addition to this, Coentrao replacing Marcelo at left back signalled a stronger defensive set up. The Portuguese international is more defensive minded than Marcelo and provides greater stability here but there is a reduction in the attacking potential of Madrid as a consequence. Madrid went with their default 4-2-3-1. Despite starting at a high tempo, the opening minutes were fairly tentative from both sides with little in the way of scoring opportunities. Madrid seemed quite content to ease themselves into the game gradually and were quite direct in the opening period, happy to play long diagonals to their forwards with little in the way of build up. Atleti looked for combinations from their three central midfielders before pushing forward, Diego often trying to run forward in possession with Arda and Adrian breaking wide and supported by their respective full back. The majority of Atleti’s positive play though, was being conducted away from the Madrid goal. Linking with Falcao further up the pitch was an issue for them. Although positioned on the right, Di Maria continually drifted in-field during the first half. This enabled Felipe to run directly at Arbeloa without worrying about leaving space for a winger to exploit. Arbeloa struggled as Atleti attacked down the left via Felipe and supported by Arda. Without adequate covering help from Di Maria, Arbeloa was cautioned on 34minutes for a foul on Felipe. The narrow approach also assisted Atleti with their three central midfielders successfully winning the ball and working it towards the wide areas. The central area was far too congested and contributed towards Madrid’s direct approach. By contract, Atleti sought to get width into their game. The lack of attacking threat from Madrid’s full backs during the opening period allowed both Juanfran, but in particular, Felipe to push further forward and provide width to the Atleti attack, allowing Arda and Adrian to move closer to Falcao. Atleti were patient in their build up play, working 1-2’s to create space for crosses into the box aiming for Falcao, whose presence had caused concerns for the Madrid defensive earlier on when they defended two set pieces badly. Coentrao had appeared a little nervous with two rash clearances from inside the penalty area and needlessly conceded a corner early on. Madrid introduced Ozil for Kaka at half time. A straight swap but Ozil was much more willing to drift from side to side and adopt wide positions as and when required. This would become more noticeable as the half wore on. The goal for Atleti was as expected. They were patient with build up play, working space before Adrian delivered a cross which Falcao, unmarked, converted. Madrid had been unable to deal the aerial problem posed by Falcao and were duly punished. Also worth noting though that Falcao was the only Atleti player in the penalty area at that time. Despite the success of the goal, Falcao was still quite isolated with Atleti’s best work continuing outside of the penalty area. The equaliser had an energising effect on Madrid who increased the intensity of their play. Both Coentrao and Arbeloa began to push forward and with Ozil appearing on both flanks, the threat from Juanfran and Felipe was declining. This consequently pulled Arda and Adrian wider, further isolating Falcao. The relationship between Marcelo and Ronaldo is a key feature of Madrid attacks. Marcelo is very attack minded and his overlapping runs help create the space for Ronaldo to cut infield. If Marcelo does not overlap, Ronaldo is faced by a full back who can track him either inside or outside and possibly supported by a midfield colleague. When Marcelo overlaps, the full back is forced to track either Marcelo or Ronaldo but clearly not both. This prevents opponents from doubling up on Ronaldo without leaving space elsewhere. This season, 38% of Madrid attacks have come down the left side of the pitch. This figure increases to 41% when you consider away games only. The second Madrid goal was greatly aided by an attacking run from Coentrao. When Ronaldo took possession of the ball on the left, Coentrao overlapped. This forced Junafran away from Ronaldo and provided enough space for him to shift the ball before shooting. Another ruthless performance from Madrid. Similarly to the recent game against Osasuna, Madrid were not at their best, however in front of goal they were clinical. Madrid took the initiative following Atleti’s equaliser and Simeone failed to respond. The influence of Diego was already on the wane in the second half when Ronaldo put Madrid 2-1 ahead. Similarly, Adrian and Arda were moving to far away from Falcao to provide width. How Simeone rectifies the issue of Falcao and his poor link play outside of the penalty area will be crucial for Atleti in the last few games of this season but more importantly, if they are to progress next season. An important step for Madrid towards reclaiming the La Liga title. Somewhere a clock is ticking…. Can you hear that? The clock ticking? Seconds become minutes become hours. It’s not counting up, it’s counting down. The clock hangs on the wall of Manuel Llorente’s office. It’s recording the final moments of Unai Emery’s managerial career at CF Valencia. It appears almost certain that the end of this season will see Emery leave Valencia after four seasons in charge. Emery has been under increasing pressure lately. The 3rd place La Liga finish which appeared guaranteed a few moths ago is now under threat with Atletico and Sevilla resurgent recently whilst Malaga must also be considered a viable threat and sit just 1 point behind Valencia. This, of course, assumes that the plucky challenges of Osasuna and Levante will fade. They may very well remain in contention and go the distance this season. Valencia could quite conceivably still finish in 3rd place comfortably in spite of their form due to the tightly packed table with just 10 points separating 8 teams. Indeed, the topsy turvy nature of La Liga was perhaps epitomised best at the weekend when Malaga, with a run of 5 wins in their previous 7 games, had the opportunity to move into 3rd place. They lost 2-0 at home to Betis. Such good fortune will not be of concern to Valencia fans and will not see Emery find any further favour with them. Valencia’s recent form has slipped with just 2 wins in the past 8 league games. The promise of early season performances has also evaporated. Successive league defeats to Real Zaragoza and Getafe was followed by a 2-1 loss to AZ Alkmaar in the Europa League. A 1-1 draw at home to rivals Levante followed on Sunday. The draw with Levante represented the 44th time that Valencia has surrendered a lead in a game under Emery. 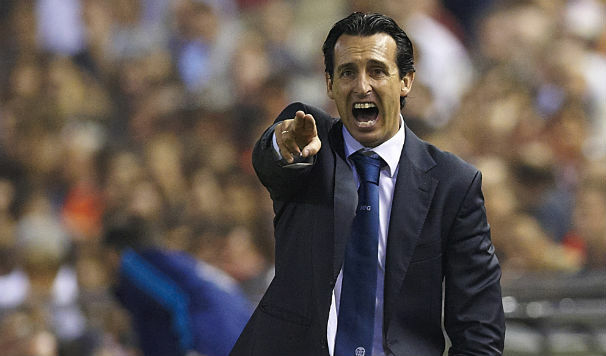 When you examine what Emery has delivered at the Mestalla and under what conditions, the criticism becomes harder to understand. A 6th place finish after picking up the pieces from the disastrous season under Koeman was followed by two successive 3rd place finishes. The financial constraints that affect Valencia see Emery wave goodbye to his best players every season and watch as new, cheaper players arrive and the process of building begins once more. Villa, Silva, Mata and Marchena have all departed. In their place the likes of Soldado, Parejo, Piatti and Ruiz have arrived. And still Emery delivers the coveted 3rd place finish. Too good for the rest of the league but unable to compete with the big two, Valencia sit in isolation. But now the 3rd place is under threat. And legitimate criticism of Emery can be delivered on performance in European competitions. Losing to Atletico on away goals in the Europa League quarter finals in season 09/10 was a considerable disappointment. A slack 2-2 draw at home enough to see a hugely inconsistent Atleti side under Quique Sanchez Flores progress. This was an opportunity missed. A similar opportunity, in financial terms at least, occurred in the following season. Valencia were never going to win the Champions League but were poised to progress to the quarter finals of the Champions League, yet somehow crumbled in the second half of the return leg against Schalke. Another lead squandered under Emery. Another German side, Bayer Leverkusen, pipped Valencia to 2nd spot in the group phase of this season’s Champion’s League. Guess what? Valencia again took the lead away to Leverkusen only to lose 2-1. This represented another disappointing European campaign but one which could be salvaged by a run in the Europa League. It started promisingly and Stoke were despatched 2-0 on aggregate. A 5-3 aggregate victory over PSV Eindhoven should have been more comfortable than the score line suggested but Valencia were in the quarter finals. Perhaps performances were on the decline but a trophy was attainable. So what now for Emery? Thursday night will see the arrival of AZ Alkmaar holding a narrow 2-1 lead over Valencia from last week’s first leg in Holland. Win and they progress to the semi finals, the first time Emery has reached this stage of a European competition. Lose and there is only the 3rd place left to pursue. Does he focus on the Europa League and attempt to win the first trophy of his managerial career, potentially sacrificing a Champions League place for Valencia in doing so? Or does he remain focussed on helping Valencia to finish 3rd for the third consecutive season thereby gaining Champions League football and the much needed income it can deliver as Valencia continue to repay their colossal debt whilst trying to remain competitive on the pitch? Only the continuation of the current poor form would see Emery depart before the season ends. The Mestalla faithful have been restless for a while and the white handkerchiefs are poised to reappear yet again tonight.